Lahmacun or Lahmajoun or Lahma bi-'ajin (Arabic: لحم بعجين‎; "meat with dough", Turkish: lahmacun, Armenian: լահմաջու), also known as Turkish pizza, Armenian pizza,, Lebanese pizza, or Syrian pizza is a round, thin piece of dough topped with minced meat (most commonly beef or lamb), minced vegetables and herbs including onions, tomatoes and parsley, and spices such as cayenne pepper, paprika, cumin and cinnamon, then baked. Lahmacun is often wrapped around vegetables, including pickles, tomatoes, peppers, onions, lettuce, and roasted eggplant. Though it somewhat resembles pizza, it has only in modern times been called by that name, and it is of Middle Eastern rather than European origin. 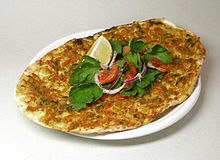 Furthermore, unlike pizza, lahmacun traditionally does not contain cheese. Lahmacun is a popular dish in Armenia, Lebanon, Syria, Turkey, and in Armenian and Turkish communities worldwide. The name "lahmacun" derives from the Arabic: لحم عجين‎, laḥm ʿajīn, short for Arabic: لحم بعجين‎, laḥm bi-ʿajīn, meaning "meat with dough". Other forms of the name are the lahmajoun and Armenian: լահմաջու lahmaǰu and լահմաջո lahmaǰo. Flatbreads in the Middle East have been cooked in tandoors and on metal frying pans such as the tava, for thousands of years. They have been used to wrap meat and other foods for convenience and portability. However, it was not until the wider adoption in medieval times of the large stone oven, that flatbreads stuffed or topped with meat or other foods were baked together, cooking the bread and the topping at the same time. A variety of such dishes, such as sfiha and manakish, became popular in countries formerly parts of the Ottoman Empire, especially Turkey, Armenia, Syria, Lebanon, and Iraq. A thin flatbread, topped with spiced ground meat, became known as laham b'ajin (meat with dough), shortened to lahmajin and similar names. Lahmacun was popular in the eastern regions of Turkey, and after 1960 it spread all over the country. Due to the hostile nature of the relations between Armenia and Turkey, the opening of Armenian restaurants serving the food in Russia was met by some protests. Wikimedia Commons has media related to Lahmacun. ^ a b c d Marks, Gil (17 November 2010). Encyclopedia of Jewish Food. HMH. ISBN 9780544186316 – via Google Books. ^ a b c Marks, Gil (1999). The World of Jewish Cooking. New York: Simon and Schuster. p. 37. ISBN 978-0-684-83559-4. ^ ""Turkish flatbread lahmacun - just don't call it pizza"". South China Morning Post. 4 April 2015. ^ Jousiffe, Ann (1998). Lebanon. Lonely Planet. ISBN 9780864423504. ^ Ghillie Basan (1997). Classic Turkish Cookery. Tauris Parke Books. p. 95. ISBN 1-86064-011-7. ^ Allen Webb (2012). Teaching the Literature of Today's Middle East. Routledge. pp. 70–. ISBN 978-1-136-83714-2. ^ Sally Butcher (2012). Veggiestan: A Vegetable Lover's Tour of the Middle East. Anova Books. pp. 128–. ISBN 978-1-909108-22-6. ^ Jeff Hertzberg, M.D. ; Zoë François (2011). Artisan Pizza and Flatbread in Five Minutes a Day. St. Martin's Press. pp. 216–218. ISBN 978-1-4299-9050-9. ^ a b c d e Carol Helstosky (2008). Pizza: A Global History. London: Reaktion Books. pp. 59–. ISBN 978-1-86189-630-8. ^ "5000 yıllık geçmiş 'Lahmacun' - Timeturk: Haber, Timeturk Haber, HABER, Günün haberleri, yorum, spor, ekonomi, politika, sanat, sinema". www.timeturk.com. Retrieved 2018-12-10. ^ McKernan, Bethan (27 October 2016). "A 'pizza war' has broken out between Turkey and Armenia". The Independent. Retrieved 10 December 2016. ^ "Lahmacun Kimin?". kapsamhaber.com/ (in Turkish). Retrieved 2018-12-10. This page was last edited on 4 April 2019, at 06:52 (UTC).